These flowers were attracting quite a gathering of wonderful butterflies at the time I came across them. Very pleasant. There are actually two different plants shown in this panel, both from Rainier. 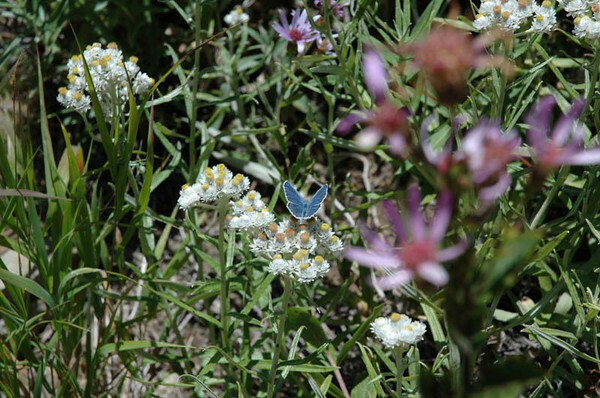 The first with the butterflies was at Naches, and the second was in the Sunrise area later in the same day. The Pearlies hands down live up to their name, everlasting. We have seen these flowers still looking fairly fresh at incredibly late times in the season. An interesting factoid from WIKIPEDIA is that although the genus includes about 110 species, almost all of them are native to central and southern Asia. Margaritacea is the ONLY inhabitant of North America. 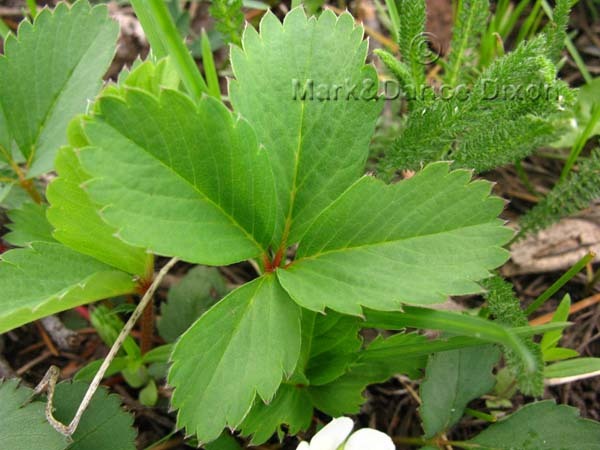 USES: The website Native American Ethnobotany has a huge number of records for this plant, amoung them: Algonquin, Tete-de-Boule Drug (Burn Dressing)Poultice of boiled leaves applied to burns. Bella Coola Drug (Tuberculosis Remedy)Plants formerly used for tuberculosis. Cherokee Drug Warm infusion taken for cold and leaves smoked or chewed for colds. Leaves and stems smoked for bronchial cough. Infusion steamed and inhaled for blindness caused by the sun. Dried leaves smoked for catarrh. Used for throat infection. Cheyenne Drug (Ceremonial Medicine) Powdered flowers chewed and rubbed on body to protect and strengthen warrior. Smoke used to purify gift made to the spirits. 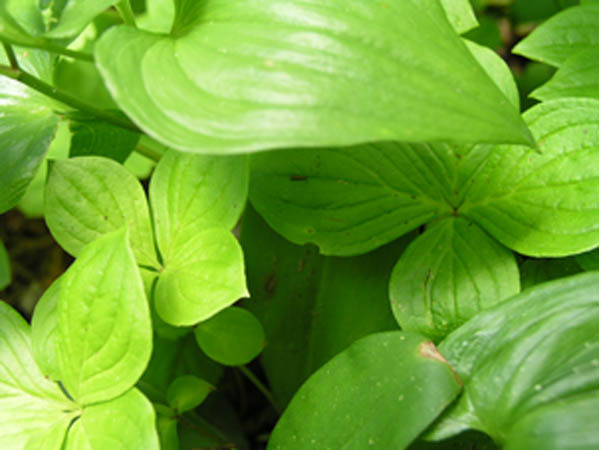 Plant used as a strong medicine.Plant used in various ways to make horses long-winded. Powdered flowers put on each hoof & blown between the ears for long windedness, spirit & endurance. Powdered flowers used on the sole of each horse hoof to make it enduring and untiring. There are many more records as well. Visit Native American Ethnobotany, enter the genus and species to see them. They are very popular as dried flower ornaments too. 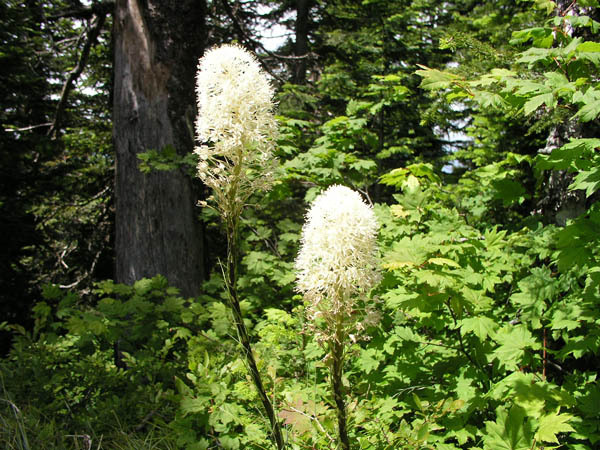 Plant location: Hiking the Naches Loop Trail on Mt Rainier (Washington state) was the area this plant was sighted. Early September 2007. Bloom season: July through September. This plant is commonly placed in the Buttercup family (Ranunculaceae) but we have followed Weber's lead in classing it in Helleboraceae. He notes that T. laxus var albiflorus of New England is very rare and now considered endangered with yellow/orange flowers. Our specimens did indeed have a pale yellowish cast to the petals. Plant location: Seen on Guanella Pass in Colorado. GPS coordinates: N39?38.121 W105?42.556 - Elevation: 10,364'. The area was very boggy with some plants in standing water. Bloom season: May to August. This plant is a perennial that dies entirely away each year. The 'bog orchids' make up a huge group. There are about 800 species within the genus that can be found in both temperate and tropical areas. 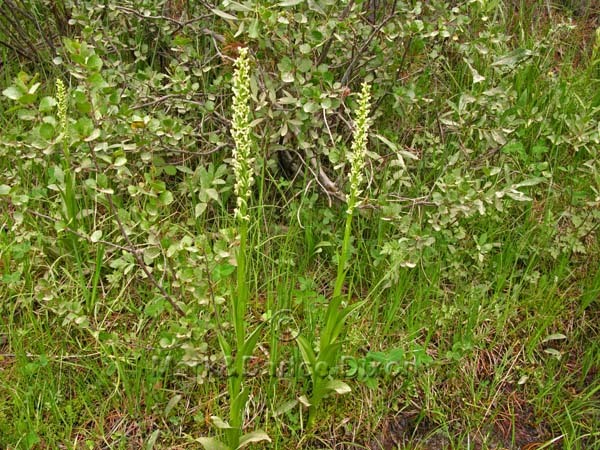 Per William Weber the plant has been reclassed from two genus, Habenaria, and more recently Plantantheria. Plant location: Seen on July 27, 2007 in Twisp Washington. Who would have thought Mark would see an ORCHID on a dual sport motorcycle ride! The plant view in this frame came from a more recent sighting in the Medicine Bow National Forest area. The date was July 21, 2009. 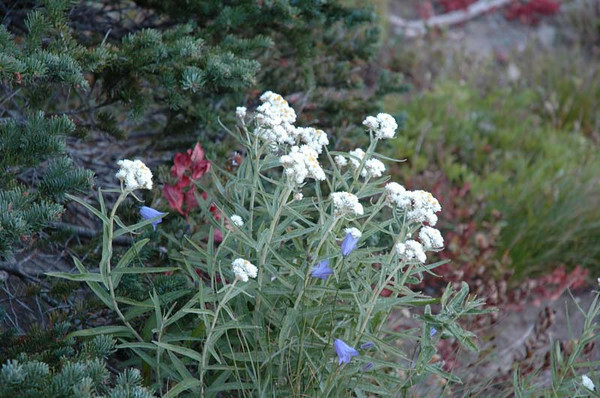 Bloom season: this plant is a midsummer blooming perennial, subalpine environment. 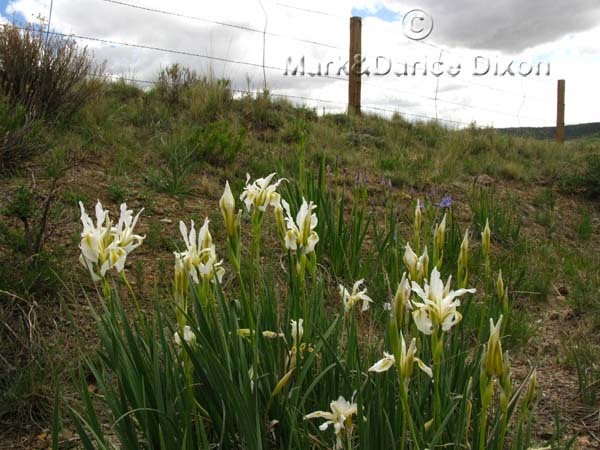 Meadow Death Camas (Zigadenus venenosus), family Liliaceae (Lily) POISONOUS PLANT!!! 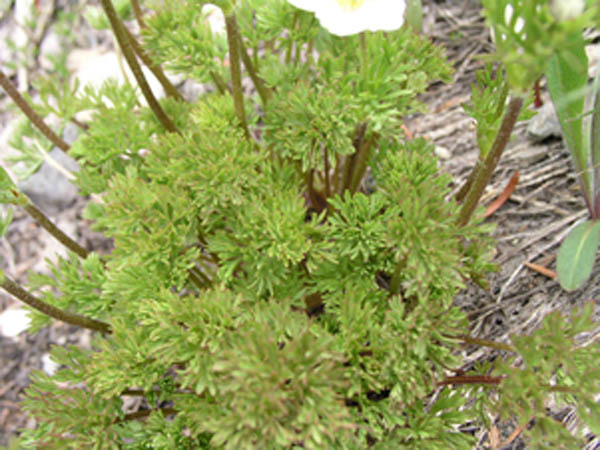 TOXIC: Per the website Montana Plant Life is the following: All parts of this plant contain the poisonous alkaloid zygadenine, which some claim to be more potent than strychnine. One bulb, raw or cooked, can be fatal. Poisoning result from confusing these bulbs with those of edible species. The bulbs of death camas are oval and covered with blackish scales. 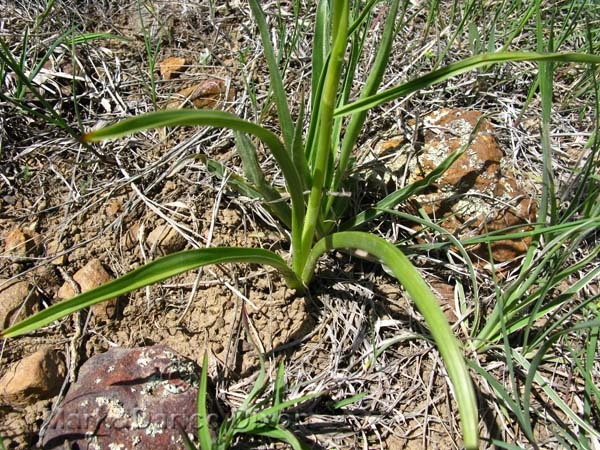 This plant causes fatalities among livestock. 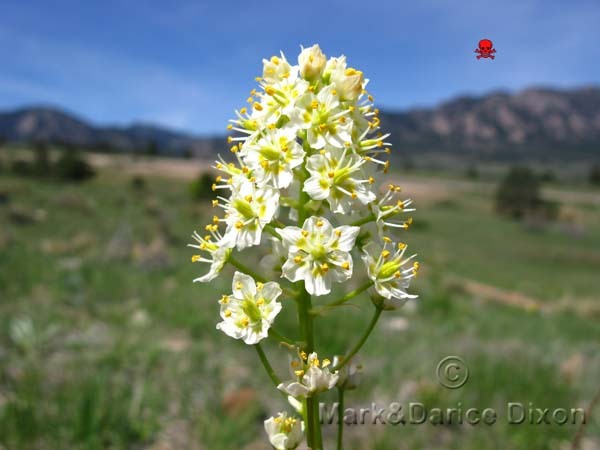 The lethal dose is estimated at between 2.0-6.0% of animal body weight, and this species is considered to be more toxic than mountain death camas, Zigadenus elegans. Symptoms of poisoning are similar for all species of animals. Symptoms in sheep include excessive salivation, froth around the nose and mouth, nausea, vomiting, muscular weakness, ataxia, possible coma, and death. The heart fails before respiration. Postmortem findings reveal the heart in complete diastole. Lesions include severe pulmonary congestion, hemorrhage, and edema. Humans have been poisoned after ingesting the bulbs and flowers. In most cases, the bulbs are mistaken for onions. A 2-year-old child became ill after eating the blossoms. Symptoms of poisoning include vomiting, slow breathing, inconsciousness (though responsive to pain or movement), hyperactive tendons and limbs, pupil dilation, and hypotension. The alkaloids cause local irritation when ingested and affect the cardiovascular system by slowing the heart and decreasing blood pressure. Treatment includes emesis, activated charcoal, and saline cathartic. Atropine was also given. End quote. Plant location: Our sighting was in a Boulder County Open Space on May 18, 2009. Quote: Distribution Dry meadows to grassy hillsides, sagebrush slopes, and montane forest in exposed places, in most parts of MT. Also from s. B.C. and Alberta to WA, OR, CA, CO, and e. to SD, ND and NE. Bloom season: Flowers April through July. This is a lovely flower, delicate and fragile looking. Well watch out - it will get ya! The plant is a stickler for detail, especially to those who wish to harvest it's fruit. The delectable berries that this plant produces are a statement unto themselves - YUM! 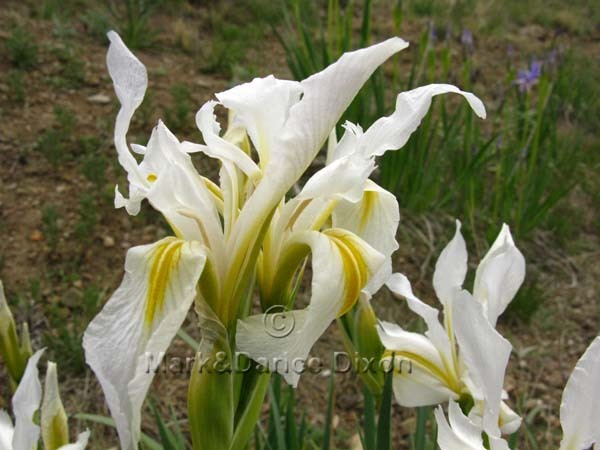 This species is distinctive amoung the huge numbers of members of it's genus by it's narrow petals. It is native to North America. 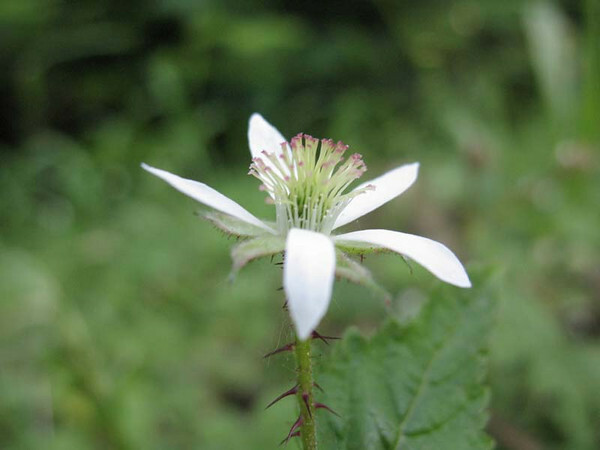 WIKIPEDIA has this information about the genus: 'The genus Rubus is a very complex one, containing 13 subgenera, the largest of which, subgenus Rubus, is further subdivided into 12 sections.' End quote. WOW! So if we are incorrect in our identification please sing out. Since these are plants that produce such wonderful fruit there have been hybrids developed en masse to further enjoy the bounty. 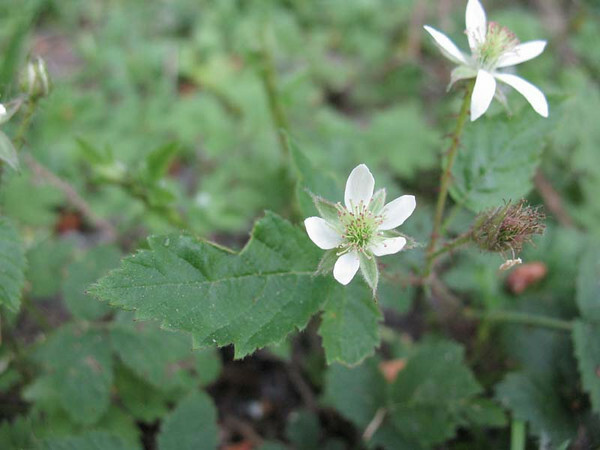 This species is said to be a predecessor of another delightful fruit, the Loganberry. Plant location: Seen on July 7, 2007 hiking in the Sunrise area of Mt Rainier (Washington state). Bloom season: Late spring to early summer, a low vine perennial. 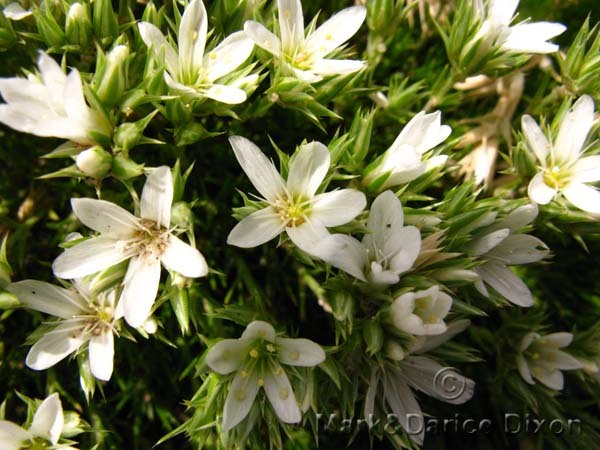 A perennial herb, this species is one of 72 in the genus. 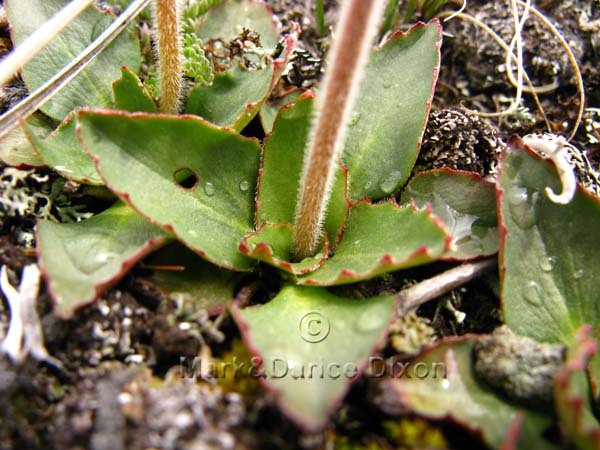 The species was formerly in the genus Saxifraga. 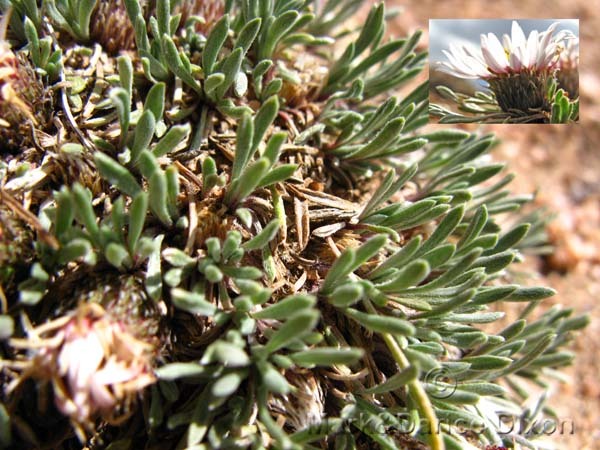 This species is an alpine lover. 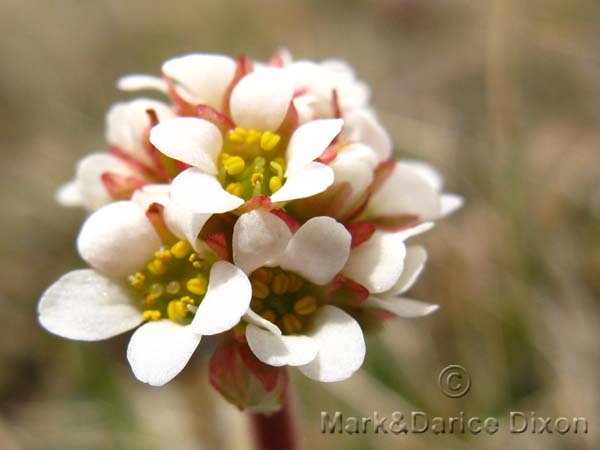 See the other members of the Saxifrage family - Hall's Alumroot - Small-flowered Prairie Star - Spotted Saxifrage - Fringed Grass-of-Parnassus - Side-flowered Mitrewort - Rusty Saxifrage - Brooke Saxifrage - - found at: Plant location: Guanella Pass on June 10, 2009. Notice the inset in the upper right corner with the immature plants shown. They were almost entirely red in the juvenile state. Only found in the following United States: AZ, CO, ID, MT, NM, NV, OR, UT, WY. Bloom season: May to August. The simple and elegant Trillium of the Melanthiaceae family is always a treat to look upon. The flower of this species is offset by large green bracts that give the plant a sturdy healthy look. Like some orchids, the plant is seriously challenged if the flowers are picked. It is illegal in Washington among other states to pick the flowers since the plant can die or take years to recover. There are about 40-50 species in the genus and the plants are native to both North America and Asia. FunFacts: A most interesting thing that we didn't know about the plant world is that some plant's LEAVES are actually underground. 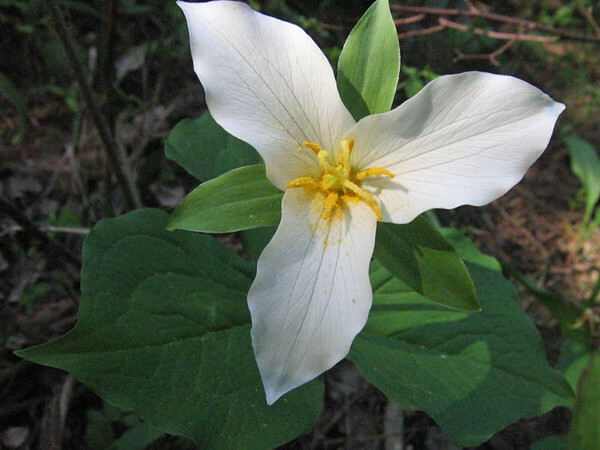 WIKIPEDIA has this to say: 'The above ground parts of Trilliums are scapes with three large, leafy bracts with the true leaves underground as a papery covering around the rhizomes.' End quote. 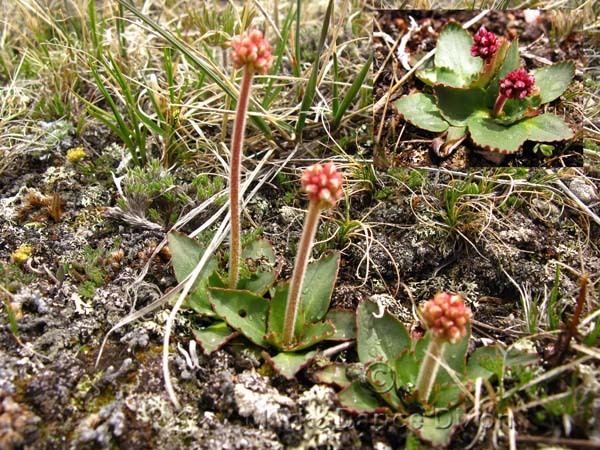 More than one surprise revealed itself during our research on this plant. Another interesting factoid from WIKIPEDIA involves the propagation of the plant: 'Trillium is one of many plants whose seeds are spread by ants and mice. 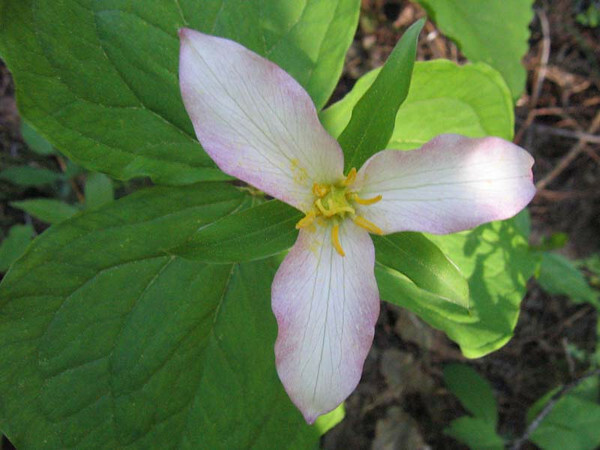 Trillium seeds have a fleshy organ called an elaiosome that attracts ants. The ants take the seeds to their nest, where they eat the elaiosomes and put the seeds in their garbage, where they can be protected until they germinate. They also get the added bonus of growing in a medium made richer by the ant garbage.' End quote. 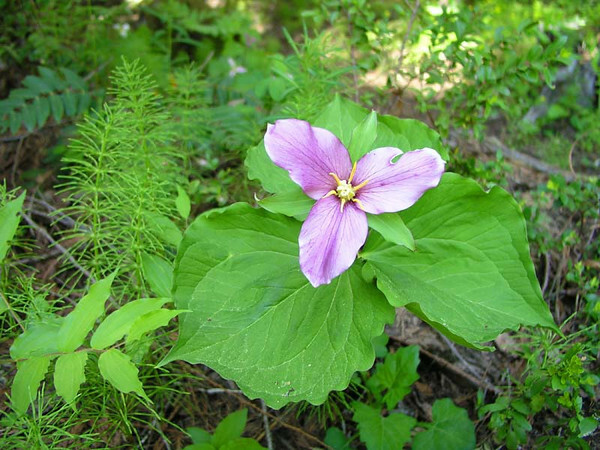 See the PURPLE Trillium here. Plant location: Seen on May 19, 2007 hiking the Ingalls Creek Trail, Alpine Wilderness area of Washington State. These plants were sighted before we were taking technical photographs of wildflowers. We hope to add foliage and plant shots to this panel, as appropriate, in the 2008 season. 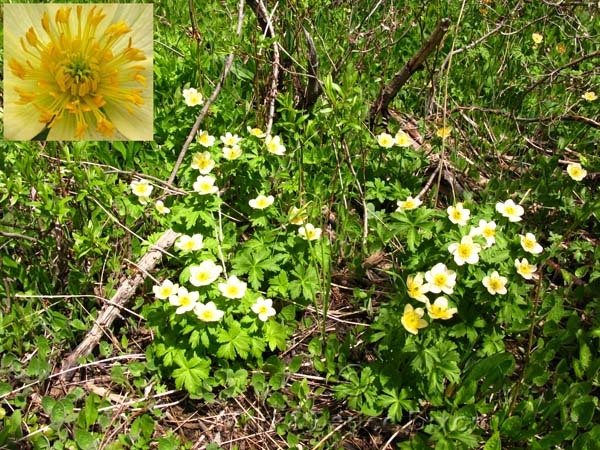 Bloom season: February through June, the plant is a perennial. The slides of this panel show the tendancy of Trillium to turn lavender or purple as the season wears on. See the Blue/Purple pages for a deeply purple Trillium that Mark photographed at Ingalls Creek as well as these white specimens. FUN FACT: From Dave, quote: "the Iris was named for the Missouri River, probably in Montana, and not for the state at all". See Blue Iris missouriensis here. Plant location: Hwy 285 between Buena Vista and Fairplay Colorado. June 10, 2009. Bloom season: May to July. These flowers certainly can be eye-catching. They stand tall, between 2-3 feet or taller. 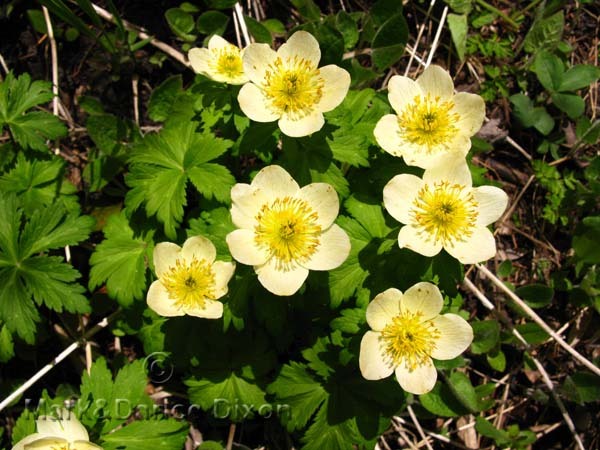 A very interesting fact to note from Dr. Dee Strickler's book WAYSIDE WILDFLOWERS OF THE PACIFIC NORTHWEST, is that these flowers do not bloom every year. In fact, under forest canopy they can bloom only as much as every SEVEN years. 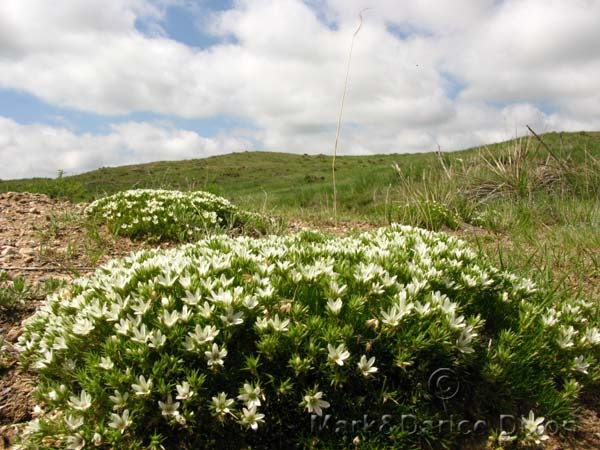 It is pointed out in the book that plants in more open sites can bloom more frequently. Bear Grass is distingushed. 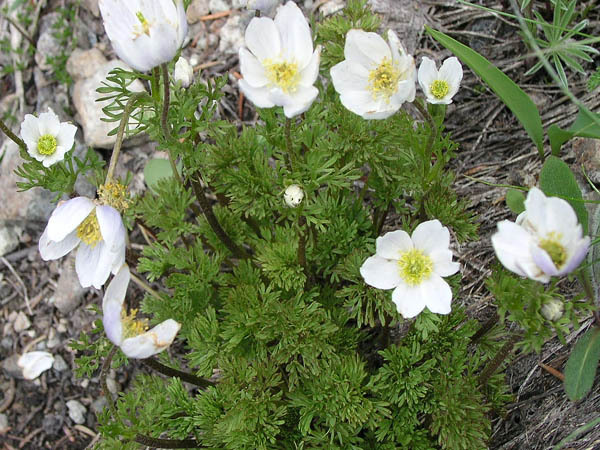 It is the official flower of Glacier National Park. 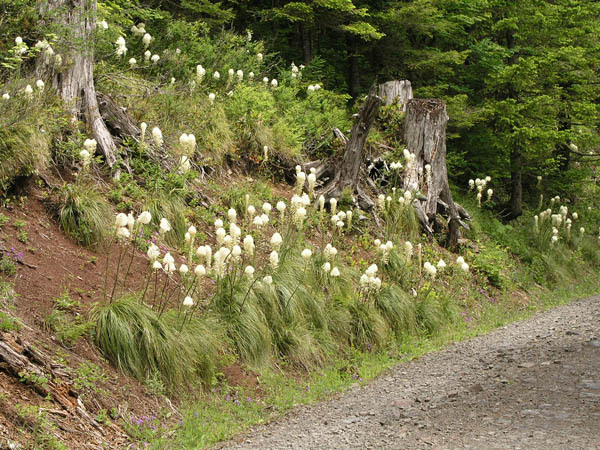 Other names for Bear Grass are Elk Grass, Turkey Beard, Bear Lily, Pine Lily, quip-quip, and Indian Basket Grass - just so's ya know. 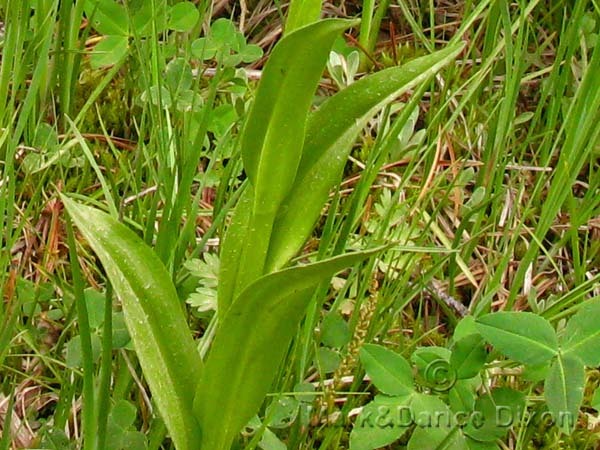 USES: Native Americans made use of the tough leaves of Bear Grass for the weaving of baskets, clothing, and making of utensils. 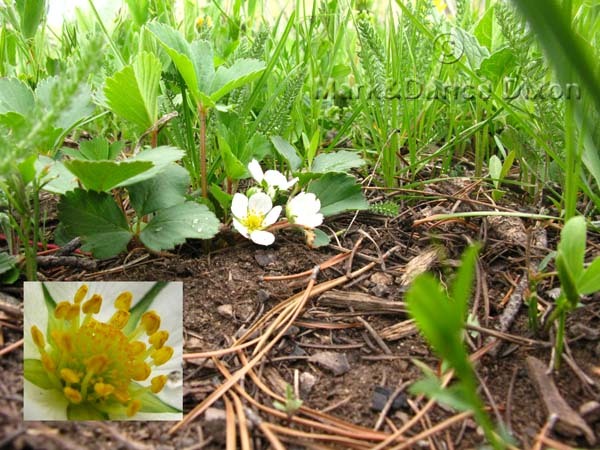 Plant location: Our photographs represent the plant in two locations. The foliage panel was from a dual sport motorcycle ride, 3 Corners area in Washington state on June 10, 2006. The other two panels were from sightings hiking Larch Mountain in Oregon state on July 1, 2007. Bloom season: June to early August. 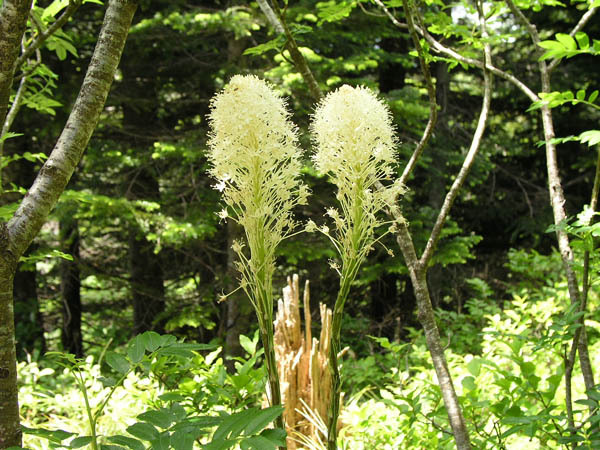 The National Audubon Society Field Guide has Bear Grass blooming starting in May. There are 5 species in this genus with 4 subspecies in vesca. 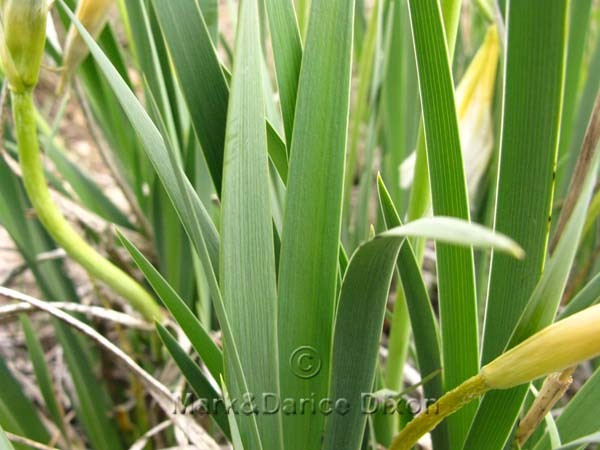 It is not uncommon to find the plants thriving but with no fruits, typical when there is too little sun. The plants can survive minor fires and re-establish themselves after fires. USES: Native American tribes used this species for food: Apache and Cochiti, fruits eaten as a delicacy. Apache, Chiricahua & Mescalero Raw fruits occasionally eaten as food. Cowlitz and Swinomish (Beverage) Leaves used for a beverage. Berries dried and used for food. Berries eaten fresh. Haisla and Hanaksiala (Preserves) Berries used to make jam and eaten fresh. Isleta and Navajo Flavorful fruit considered a delicacy. The flowers of this species have both male and female organs and are pollinated by insects. 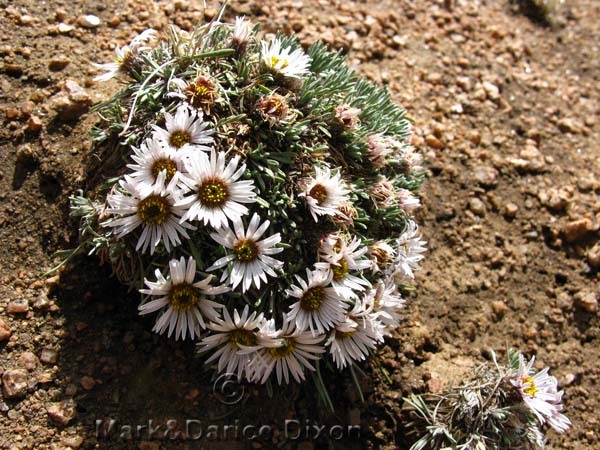 Plant location: Found on Cottonwood Pass near Granby Colorado on May 27, 2009. The species is located in the following United States: AZ, CA, CO, ID, MT, NM, OR, TX, UT, WA, WY. Typical habitat is along trails and roadsides, embankments, hillsides, stone and gravel laid paths and roads, meadows, young woodlands, sparse forest, woodland edges and clearings. Bloom season: April to May, early June with fruit ripening through July. Sometimes as long as September. 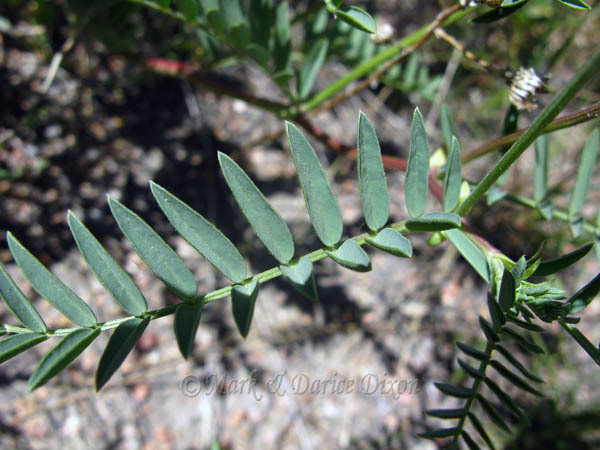 The foliage of this plant represents the identifying characteristic. 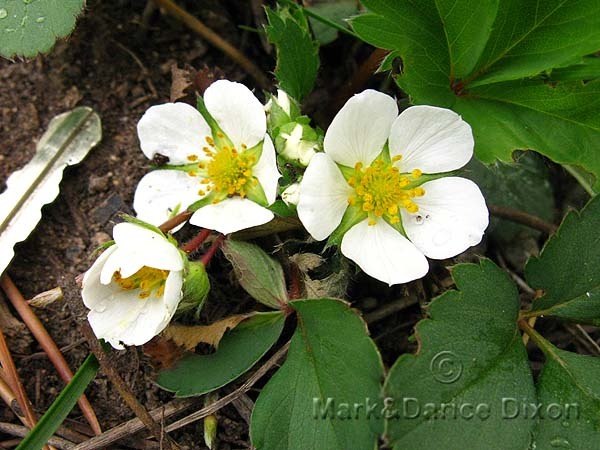 It is sharply toothed rather than the course-toothed edging found in Wild Strawberry (Fragaria virginiana). The fragrant flowers closely resemble Vanilla Leaf. Don't be fooled. The smoothed edged heart shaped leaf formation is a clue about 'who' you are looking at. 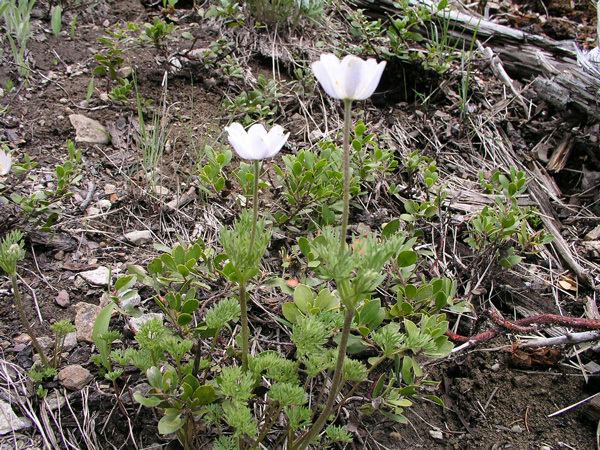 Note a discrepancy in family information of this genus in WIKIPEDIA and the book WILDLFOWERS OF THE PACIFIC NORTHWEST by Turner and Gustafson. 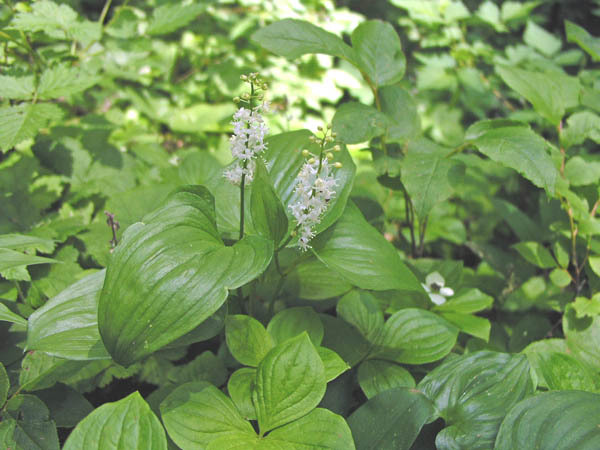 According to WIKIPEDIA, Maianthemum dilatatum, is of the family Ruscaceae. 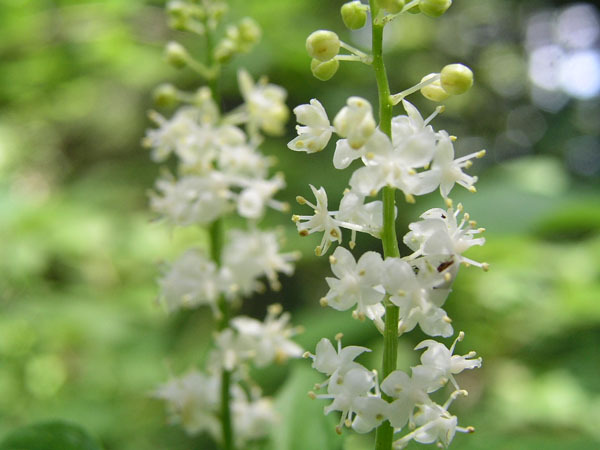 If you find yourself hiking in a area forested with Sitka Spruce, you will likely find False Lily of the Valley. Take a whiff of it's delicate aroma but don't eat the berries from this plant - not all that yummy! Medical uses include sore eyes, cuts, and sterility. 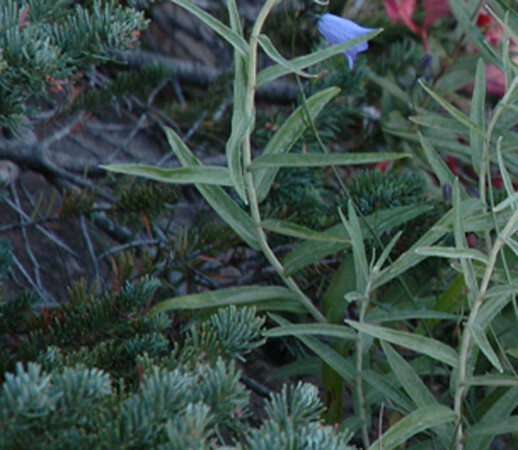 These blooms are even found in Alaska. Botanically, this plant grows parts in fours rather than threes or sixes as is usual in the Lily family. 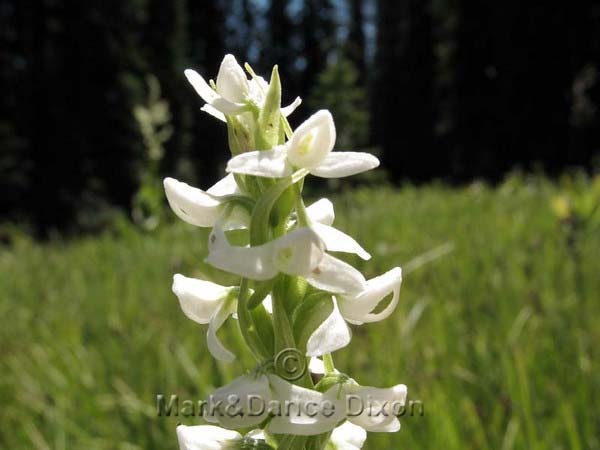 Plant location: This specimen was sighted hiking Larch Mountain in Oregon on July 1, 2007 Bloom season: Late spring and in the case of our specimen, mid-summer. The pods don't lie! Our newest sighting of this species came with fruit started on the plant confirming what was previously a guess. 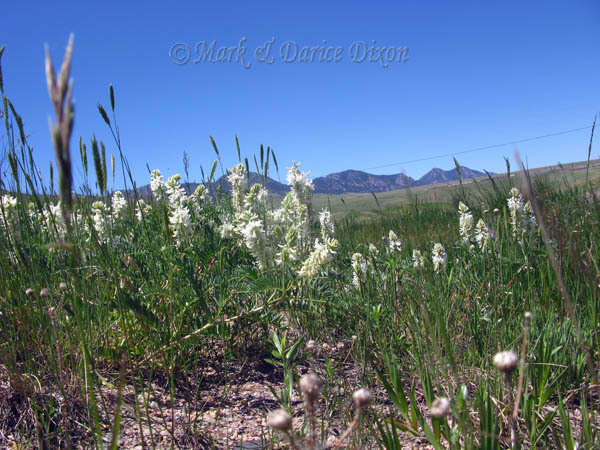 The white variety of the species is quite prevalent in the areas noted, as opposed to the blue/purple being more common south of Denver near Pueblo and Florence Colorado. The species hazard to livestock is well described by WIKIPEDIA: 'The Astragalus bisulcatus accumulates large quantities of selenium when grown on soils that have selenium, the plant produces amino acids where sulfur is replaced by selenium. 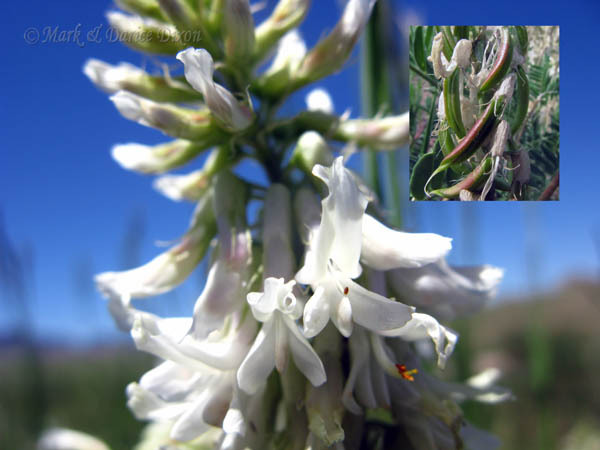 Most animals avoid Astragalus bisulcatus because of the musky odor of the dimethyl selenium compounds contained in the plants tissues. 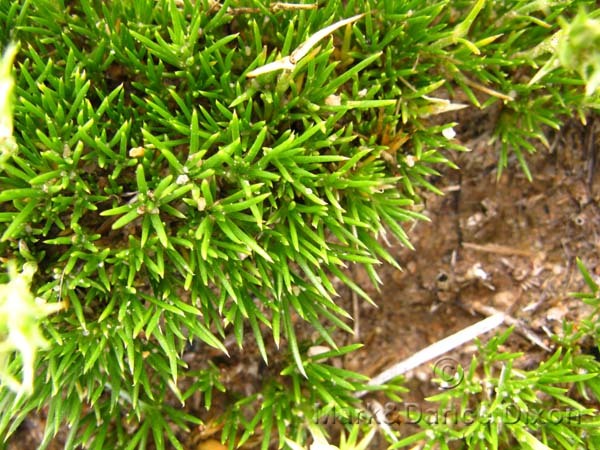 Yet, sheep and cattle have indulged in eating the plant, becoming victims of selenium toxicity. Sheep can die in thirty minutes from eating a half a pound of Astragalus bisulcatus, and in 1907 and 1908, approximately 15,000 sheep in Wyoming died with symptoms of either alkali disease or the blind staggers; both of which were outcomes of digesting a large amount of selenium from Astragalus bisulcatus.' End quote. See the blue/purple example of bisulcatus here. Plant location: Discovered along Hwy 93 and Hwy 128 Colorado on June 11, 2011. 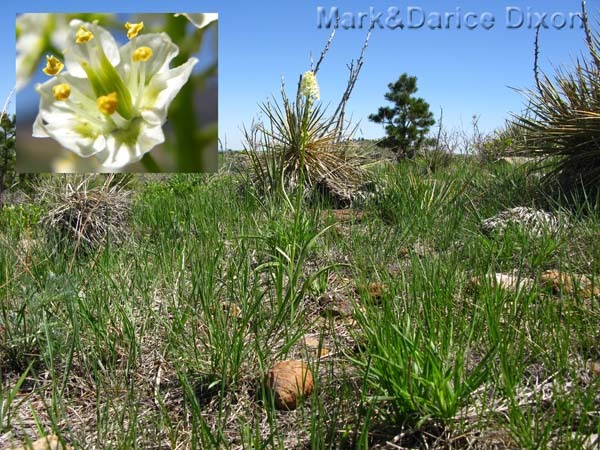 The USDA Plant Database shows this species in the following states: AZ, CO, ID, KS, MT, ND, NE, NM, NV, OK, SD, UT, WY. Bloom season: March through June in Colorado. The foliage of this plant almost looks like stubby wild carrot, but don't eat it - bitter! It is a native to western North America. These flowers have 150 to 200 stamens!! Later in the season, the flowers turn into a very hairy proposition indeed. They are actually the fruit of the plant at this stage. Plant location: sighted hiking Esmerelda Basin outside of Cle Elum Washington - June 17, 2007. A great hike! Bloom season: May through September. 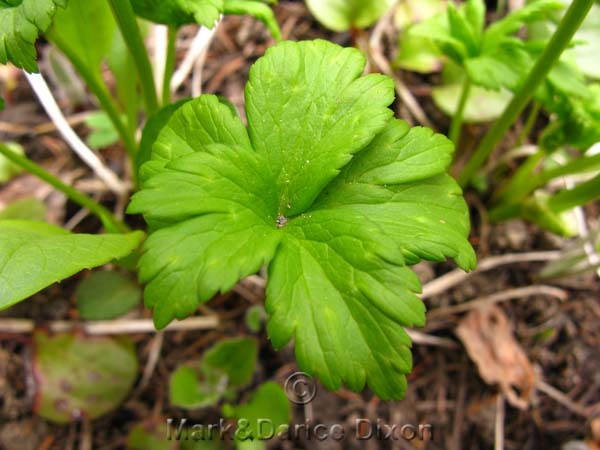 This perennial herb is native to North America with about 26 species total in the genus. 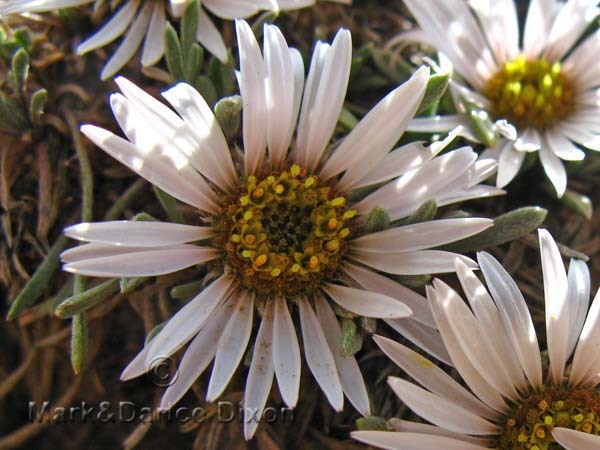 The cheerful little flowers are low to the ground and grow in small clusters that are almost mat-like. When done flowering they produce fluffy white seed heads similiar to dandelions. Plant location: Cherokee Refuge in Colorado on April 23, 2009. Found only in these United States: AZ, CA, CO, ID, MT, NM, NV, UT, WY. Bloom season: April to June, sometimes into July. Although William Weber classes Eremogone in it's own family, Alsinaceae (Chickweed) we are showing it's family where most sources place it. In the Pinks. There are 3 subspecies: hookeri, pinetorum, and desertorum, according to the USDA Plant Database. (Flora of North America does not include desertorum as present in the U.S.) Plant location: Seen on the awesome Pawnee Butte Trail #840, Weld County Colorado on June 4, 2009. Found in the following United States: CO, KS, MT, NE, NM, NV, OK, SD, UT, WY. Bloom season: June and July.